1999-01-09. New. Ships with Tracking Number! INTERNATIONAL WORLDWIDE Shipping available. Buy with confidence, excellent customer service! Prentice Hall. Hardcover. 013805326X New Textbook, Ships with Emailed Tracking from USA . New. 1989-01-07. New. Ships with Tracking Number! INTERNATIONAL WORLDWIDE Shipping available. Buy with confidence, excellent customer service! Pearson. Hardcover. 0321856562 . New. 2014. Addison Wesley, 1999-01-09. 3rd. Hardcover. Used:Good. 2017-07-12. New. Ships with Tracking Number! INTERNATIONAL WORLDWIDE Shipping available. Buy with confidence, excellent customer service! Pearson. Hardcover. 0321856562 New US Edition Textbook, Ships with Emailed Tracking from USA . New. 2017-07-12. Good. Ships with Tracking Number! INTERNATIONAL WORLDWIDE Shipping available. May not contain Access Codes or Supplements. May be ex-library. Shipping & Handling by region. Buy with confidence, excellent customer service! 2013-03-08. Good. Ships with Tracking Number! INTERNATIONAL WORLDWIDE Shipping available. May not contain Access Codes or Supplements. May be ex-library. Shipping & Handling by region. Buy with confidence, excellent customer service! World Publishing Company; 1 edition (January 1. 2006). paperback. New. Ship out in 2 business day, And Fast shipping, Free Tracking number will be provided after the shipment.Paperback Pages Number: 576 Publisher. : World Publishing Company; 1st edition (January 1. 2006). 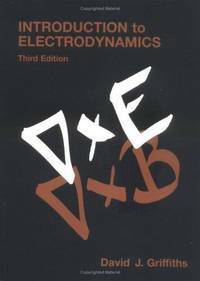 Introduction to Electrodynamics (3rd edition) introduced a pillar of the Department of Physics. undergraduate course electrodynamics . And theoretical mechanics. thermodynamics and statistical physics and quantum mechanics together are generally referred to as the four mechanics. constitute the core of the fundamental physics of theoretical knowledge training students. but also to further study th... Satisfaction guaranteed,or money back. David Griffiths received his BA and PhD from Harvard University. He held post-doctoral positions at the University of Utah and the University of Massachusetts (Amherst), and taught at Hampshire College, Mount Holyoke College, and Trinity College (Hartford) before joining the faculty at Reed College, where he has taught for over 30 years. In 2001-2002 he was visiting Professor of Physics at the Five Colleges (UMass, Amherst, Mount Holyoke, Smith, and Hampshire), and in the spring of 2007 he taught electrodynamics at Stanford. Griffiths is a Consulting Editor of The American Journal of Physics, and a Fellow of the American Physical Society. In 1997 he was awarded the Millikan Medal by the American Association of Physics Teachers. He has spent sabbaticals at SLAC, Lawrence Berkeley Laboratory, and UC Berkeley. Although his PhD was in elementary particle theory, his recent research is in electrodynamics and quantum mechanics. He is the author of forty-five papers and three books: Introduction to Electrodynamics (Fourth Edition, Prentice Hall, 2013), Introduction to Elementary Particles (Second Edition, Wiley-VCH, 2008), and Introduction to Quantum Mechanics (Second Edition, Prentice Hall, 2005). TBS. Paperback. B009NOB1JS Unmarked text. . Good. 1999-01-01. Prentice Hall, 1989-01-01. 2nd. Hardcover. Used:Good. Pearson. Hardcover. 0321856562 Clean text. Dents on cover corners. May have small hole on spine. Priority shipping available on this item. **NO international shipping. -6b- . Very Good. Cambridge University Press, 2017-08-31. Hardcover. Good. Prentice Hall, 1981-01-01. Hardcover. Used:Good. Cambridge University Press. Hardcover. 1108420419 Special order direct from the distributor . New. Pearson, 1998. This is an ex-library book and may have the usual library/used-book markings inside.This book has soft covers. In good all round condition. Englewood Cliffs, NJ: Prentice-Hall, Inc., 1989. 2nd Edition. Hardcover. Fine. Size=7"x9.5". Text Illustrations. (full book description) Prentice-Hall, Inc., Englewood Cliffs, NJ, 1989. 2nd Edition Later Printing, Fine-, Hard Cover, DJ Not Issued. Size=7"x9.5", 532pgs(Index). Text Illustrations. From the library of Physics Prof. Emeritus, Daniel Sperber of RPI in Troy, NY with his owner name embossment on front endpaper, small ink date stamp (2), numbers (2) on last Index Page, o.w. clean, bright & tight. ISBN 0134813677 [Electrodynamics; Vector Analysis; Electrostatics; Magnetostatics; Radiation; Relativity] SELLING WORLDWIDE SINCE 1987. WE ALWAYS PACK WITH GREAT CARE! 1981-09-06. Good. Ships with Tracking Number! INTERNATIONAL WORLDWIDE Shipping available. May not contain Access Codes or Supplements. May be ex-library. Shipping & Handling by region. Buy with confidence, excellent customer service! Prentice-Hall. Hardcover. 013481374X New Condition. . New. Prentice-Hall. Hardcover. 013481374X Like New Condition. . Fine. Prentice Hall of India, 1998-12-30. Paperback. Used:Good. Cambridge University Press. Hardcover. 1108420419 Expedited shipping NOT available. Brand New. Exceptional customer service. Standard shipping is ground. All deliveries in 4-14 business days. . New.